This Royal Enfield Military looks rough and ready. 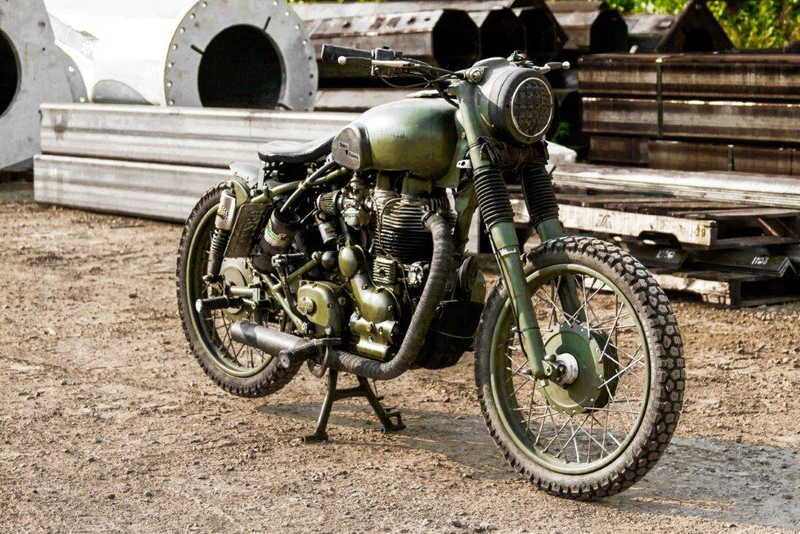 Here's a custom Royal Enfield Bullet Military that looks tough enough to rough it anywhere. 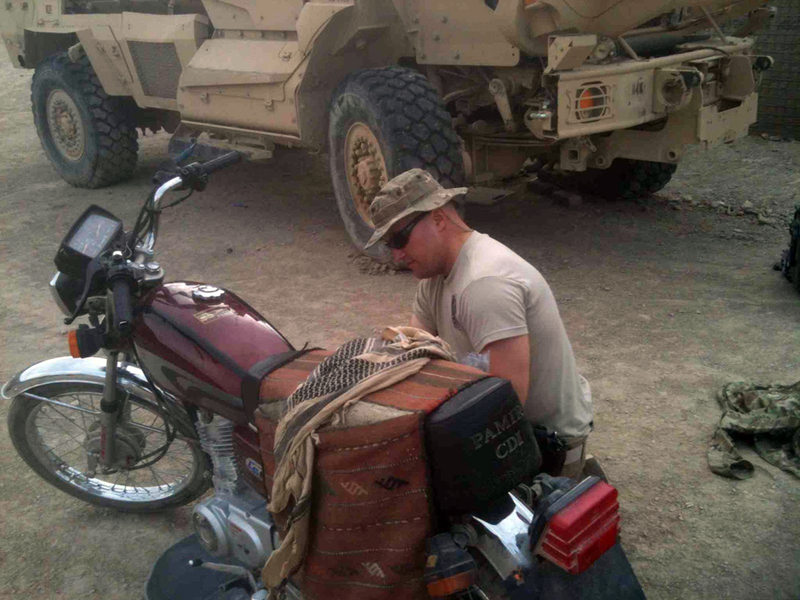 "It’s a 2007 Military model that I’ve messed around with quite a bit: new exhaust, air intake, custom rear fender, tail light bracket and 8 ball oil dipstick, LED tail light, solo seat, new grips, modified oil system, new tire and other stuff I’m sure I’ve forgotten. 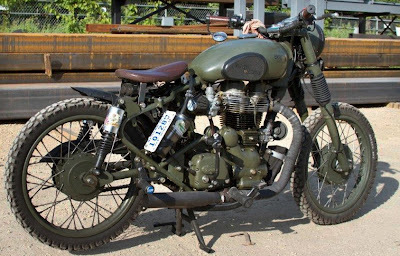 This bike is a blast and runs like a top!" "Yes, that’s me in the photo. I do live in Minnesota, married to a beautiful woman (who is doing her best to try to understand my obsession with bikes) and four kids. I am in the Army and was gone last year in Afghanistan. Chris over at Her Majesty’s Thunder sent me some patches while I was there and he posted some photos on his blog. "I missed a whole lot back home, including an entire riding season, so I’ve been busy ever since I’ve been home messing around with the bike. "It’s the original headlight, I’ve just cut a piece of vinyl film and placed it over the headlight. I saw someone do it with yellow vinyl to their old BMW (to give it that French look that seems to be popular with café and bobber bikes lately) at a bike event here in Minneapolis and it got me thinking about what else was out there. Looked on eBay and found this sheet of black and thought, why not? I think it looks pretty cool and adds to the ‘tough’ look of the bike. Who knows, next week I may get tired of it and in that case I just peel it off. Lights ride under the seat, a spingless solo. "Yep, that’s the tail light (under the seat), as well as turn signal. It’s all integrated in one. My best buddy Josh Hoglund, who does fantastic metal fabrication, dreamed up that bracket under the seat after I showed him the new tail light that I bought (again, eBay). He also made up the custom rear fender and brackets as well as the 8 ball dipstick. Very talented guy. "I debated using springs for the seat, but decided against it. First, for the look. I was going for something more non-traditional on this bike and springs made it look too ‘vintage’ and, second, I found out that when I had them on there it really didn’t make too much of a difference in ride. "It’s loud and it gives the Enfield torque. 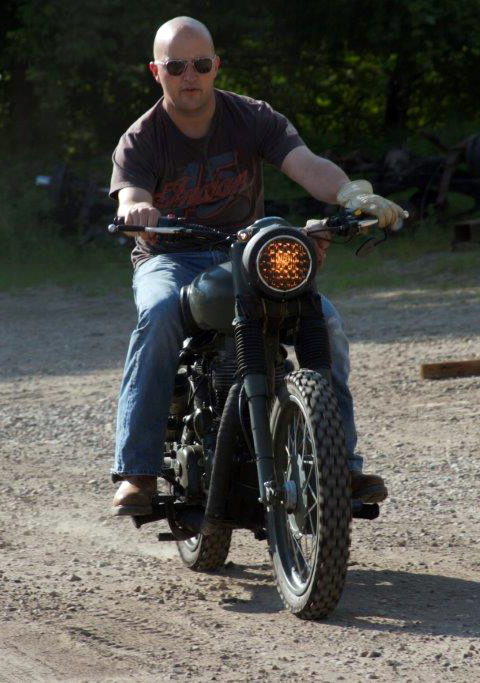 My buddy said ‘this thing went from a lawnmower to a #%$& motorbike!'" The chain guard came off then went back on. 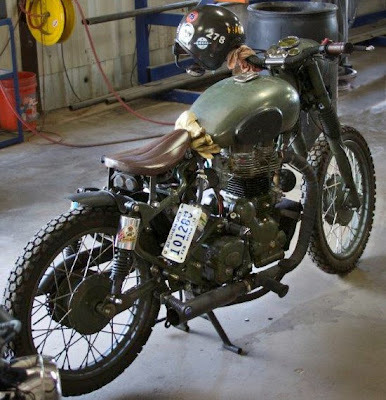 "Yes, the chain guard (I found out) was essential to keep the crap that the chain spits up off my back... I kept the rear pegs to give my legs a different position on long rides (although I tell people it’s where I stand while I’m doing wheelies). 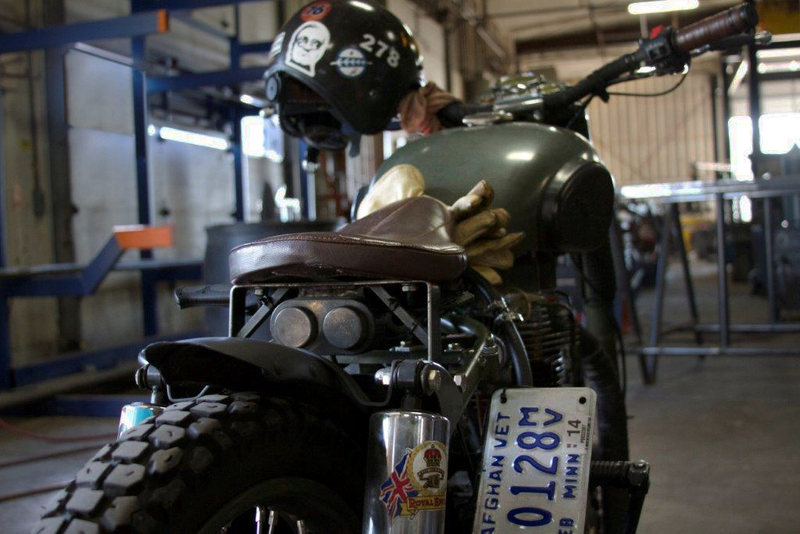 "It’s got elements of bikes that I gravitate toward: bobbers, dirt trackers, vintage, café. So I just say it’s the bike that this bike was meant to be." From Her Majesty's Thunder: Dan in Afghanistan in 2012 fixing an abandoned cycle. He gave it to the Afghan Army.